No matter how durable a golf club you choose there is always some wear and tear that’s prone to happen. Constantly holding your putter would cause the grip to wear out. Be it due to rough handling or due to aging, your putter’s grip might be damaged due to a lot of reasons. This is why knowing how to re grip a putter would come in handy. There are many ways to re grip a putter. If you learn the procedure and get the right materials required you can always do it yourself. How often you regrip your putter would depend on the way you use it. Sometimes regripping is required, not only because the grip is damaged but also in cases when the current grip becomes slippery to use. In both cases, you have to regrip. You need not wait for visible signs of damage to show before choosing to regrip. You can always do it periodically. That said, refrain from doing so too often. You can choose to go to a retailer or club fitter to﻿﻿ regrip your putter. But given the ease of doing it, most golfers prefer doing it themselves these days. This increase in the number of DIYs in regripping has made it easy to find all the required supplies. Yes, that is going to make it a bit overwhelming for you to choose. But we are here to make it easier for you to gather all the supplies and regrip the putter yourself confidently. When you plan to start regripping, here are the major supplies that you will have to gather. It is that simple. You remove the old grip and replace the new one in place. It is all about choosing the right grip and neatly replacing the old one. Choosing the new grip is the most crucial part. 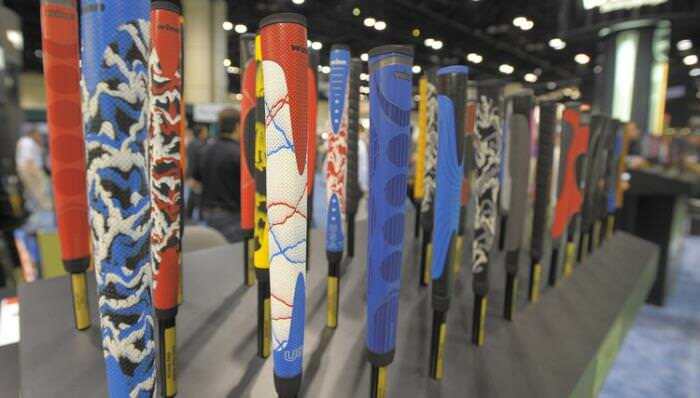 There are lots of types when it comes to golf club grips. Choosing the right material grip would ensure you have the perfect handling for every stroke. Then comes the thickness of the grip. There are the usual sleek ones available but then there are also thicker grips. Recently we find that thick grips are gaining a lot of popularity in the market. This is mainly because thick grips are found to show a marked improvement in the stroke. This is mainly due to a simple fact. When you use a thin grip you would be able to curl your fingers around a whole curve. A double sided tape is what you need. Not any usual double sided tape but the ones specially available for putter grips. You would be able to find this tape from any supplier that sells putter grips as well. Strength and quality of this adhesive would determine how securely your new grip stays and so choose the best one. As we mentioned earlier as the grip is going to be the most important element in the whole “regripping” process. So, are you confused about choosing the right grip? How To Choose a Putter Grip? Putter grips might be a little different from the normal grips available for the other golf clubs. Unlike other club grips, putter grips might not always come with a circular cross-section. If you are choosing one which doesn’t have a circular cross section pay special attention to the symmetry. The tapering provided at the end of the putter grip should also be just the right size. Evidently, you would want something that snugly wraps the putter. In the putter, grips, the axes of grip and the shaft do not coincide. We now also find a lot of textured putter grips. These are meant to ensure that the surface doesn’t get slippery when your palms sweat. You also have the option to install two putter grips one beside the other. Take into consideration all such factors and finally decide the right combination of grips to suit your style. Now that you are done choosing an essential part, here is the step by step procedure of how to replace your old grip. Once the grip and the tape have been removed you would still have traces of the old adhesive left on the shaft. A new grip would fit perfectly on an absolutely clean surface. Dip a piece of a washcloth or a sponge in the solvent. Use it to gently clean the surface of the shaft where the old grip was. If you find prominent traces of adhesives or tape still left allow the solvent to stay for a few seconds. This would loosen the adhesive and ensure that the tape scraps and the old adhesive come off clean. Once you do this use a dry piece of cloth to remove the solvent and clean the surface. Before you start winding the tape ensure that you have the right length required. It would be a good idea to get the suitable length of tape along with the grip. The retailer would be able to assist you in picking it. This would be a better choice than depending on leftovers you already have. If you attach the tape in bits it might lead to misfit of the grip. Start winding the tape from the bottom. Measure out the size of the grip and mark the area where it ends. From there wind the tape upwards. Move upwards slowly winding the tape tightly. Stop and smooth out the tape at each swirl to ensure bubble-free wrapping. Without any overlap wind the tape with equal spaces. If you are choosing a thicker grip you might need a tighter winding of the tape. This would help firmly secure the grip. But for a normal putter grip winding the tape with gaps would be sufficient. This should be remembered while choosing the length of the double-sided tape. Do not settle down for a cheap double sided tape. No matter how great your grip is if your tape quality isn’t good it would be of no use. So even if it is expensive, go for something that comes with strong adhesion. Also, choose a tape that comes with a good adhesive material. This should not corrode or damage the shaft below. Once you are done covering the whole area where the grip goes, tuck the last part of the tape to the shaft. One other factor which we should not ignore about the tape is the width of the tape. A narrow tape would be suitable to go in a spiral, several rounds. But if you choose a slightly wide tape then it might make it difficult to wrap the tape without forming folds during every turn. Instead, you can go for tapes that are super-wide, at least 3inches. This would make your work simpler. You can simply place the tape lengthwise and go one round to fully wrap the shaft. You can then cut off the excess tape and tuck a small piece at the end to seal it well. Now we reach the final part of the regripping process. Take out your new grip. Wipe it clean and keep it ready. Once you are happy with the application of the tape, remove the shielding paper on the exposed side. Mineral spirits can make it easy to put on the grip. It is a totally optional step though. Dampen the inside and outside surfaces of the grip with the mineral spirits or solvent. Pour it into the grip blocking the other end to allow the spirit to be absorbed by the inner surface. Once you do this empty the spirits from the grip on to the putter shaft. By doing this you are making both the surfaces smooth enough to slide and offer a good fit. This is important because foam and other grip materials can offer a lot of friction this would make it difficult to slide in the grip. So you would end up having a grip that is stuck on the tape half way, difficult to push inwards. ​Now you would be sliding the grip. This would have to be done in a single swift step. Before the spirits fade off quickly slide the grip on the shaft. Use both your hands and push the grip down to its place. You can use a flat surface, a table top or the wall to give a flat thrust to the exposed end of the grip. Do not wiggle while you insert the grip. This might lead to misalignment of the grip. ​If the grip or the shaft is not properly covered with solvent it might make this process difficult. ​No matter how careful and quick you are misalignments are prone to happen. This is particularly true if you are regripping your putter for the first time. Compare the putter face to the grip. They would be at right angles in ideal alignment cases. Before you apply pressure on the grip check the alignment. The full length of the grip should also be uniformly placed on the shaft without any folds and twists. Once you are absolutely satisfied with the placement and the alignment start applying gentle pressure on the outside of the grip. This would help the grip hold the tape firmly. But for the adhesive to fully dry and offer a tight fit it would take few hours. 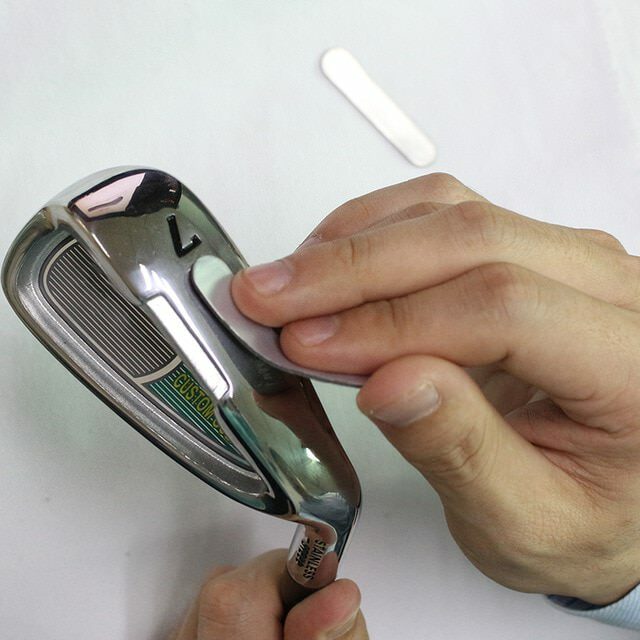 Remove the putter from the vice and leave it on a flat surface to allow the adhesive to dry. Hope this helped you understand the process of regripping your putter. We hope that you would be able to do it yourself next time. Do share your experience with us. If you made some mistakes during the process, do share those with us so that we do not make them. To choose a grip you can make a decision based on your experience. But you could also use any of the grip selector tools available online. This would ensure that you do not miss out on any of the new options currently available on the market. Finally, it all boils down to individual preferences indeed. Though we mentioned that thicker grips are great they too might feel uncomfortable for few golfers. For quicker and longer shots putters with thicker grips might feel a little difficult. Once you start noticing minor signs of damage on your grip you should consider changing it. A perfect grip would provide perfect gameplay. Even the smallest tears can sometimes create a bit of an impact on your strikes. If you are choosing textured ones to address the slipperiness issue then choose something which is not too bumpy. Bumpy ones might be difficult to hold for longer practice sessions. Having mentioned all that about choosing grips, it is now your choice. Why settle down for any grip that a retailer would install on your putter? Pick the best one and replace it yourself.